Sunday had been a late night watching the Olympics and Monday night would likely be no different. The sun sets close to ten this far north and at the western edge of the Eastern Time Zone, whereas at home it would be close to nine. However, the days are getting shorter and summer is getting close to an end, at least for our time at the lake. I finished Monday’s post, cooked breakfast, and jumped into chores. Figure out what is wrong with the boat, weed, and read, and weed more. Momma jumped into cleaning, priming, and re-painting the pump house and the kids played in the water with Ivy. I have been reading non-stop this summer; so far, I have plowed through eleven books and, right now, I am in the middle of two books. Yes, I am reading two books at the same time. W has a reading assignment, too and we looked at his list and narrowed to a few choices. We stopped at a Barnes and Noble on the way to Ohio last week and bought three of them and the two more arrived yesterday in the mail. The list is below and I starred his choices or my suggestions. When we first looked at the list, he pooh-poohed all of the choices and I tried to encourage him, after all I am a reader and an LA teacher. I had read two of the books and had some background knowledge for a couple of the others. I started at the top of the list and gave him background about the first one, Mistaken Identity, and he decided he wanted to read it. It was among the books we picked up last week and I started reading it last Friday night. I read the first five chapters and I was confused about the story, the characters, and kept having to re-read and look back at the story. I knew it wasn’t a good fit for W and said so. So, we were down to four books and possible a fifth. We weeded through the books and tossed out a couple, narrowing it to two. I’m not sure where we left it, but he hasn’t started reading and I am not sure I would either; there’s too much fun to be had – swimming, playing, and just being a boy and outside. Regardless, I added several of the books to my to-read list and started reading Fallen Angels the prequel to Sunrise over Fallujah. The kids headed out to the lake and their friends and I went to work weeding which is a never-ending task here. I got quite a bit weeded, before stopping for the day to make dinner and clean up. Beth got a first coat of paint on the pump house and as we picked up the yard, we could hear the rumble of thunder in the distance and see the clouds to the west. It seemed forever waiting for the storm to arrive. Before the rain, there was lightning, and lots of it, with W dressed like Jim Cantore in a rain suit and his phone running around outside as the lightning flashed among the clouds. With the lightning flashing illuminating the clouds, I was leery of venturing outside. We got W inside, but he sat by the door watching the storm roll in. we’d been watching the Olympics and cheered as Misty Franklin won the Gold Medal. When the men’s gymnastics started, I suggested turning out the lights, the TV, and watching nature’s fireworks. Actually, I just did it and everyone followed along. 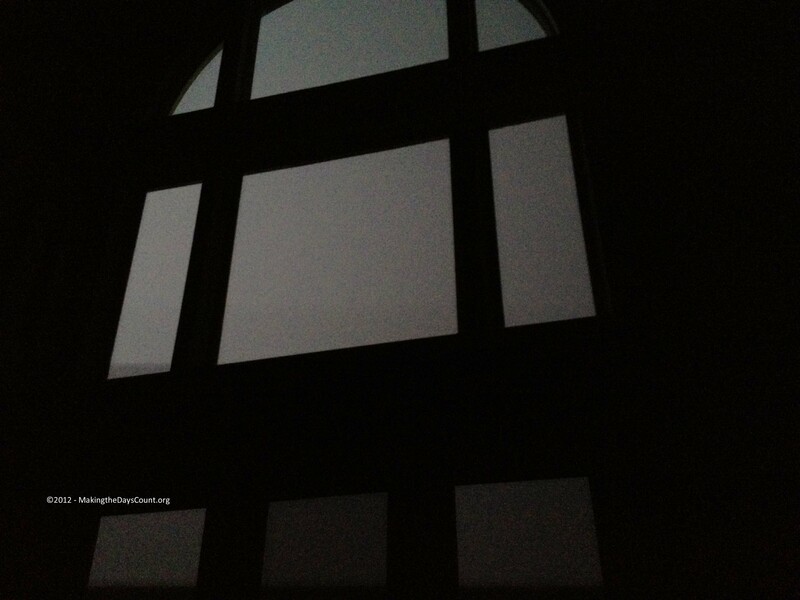 We sat in the front room facing the lake and watched the lightning show. Eventually, the rain started and the storm was in full bloom. It rained and flashed for about forty minutes and then the power went out about 11:30. 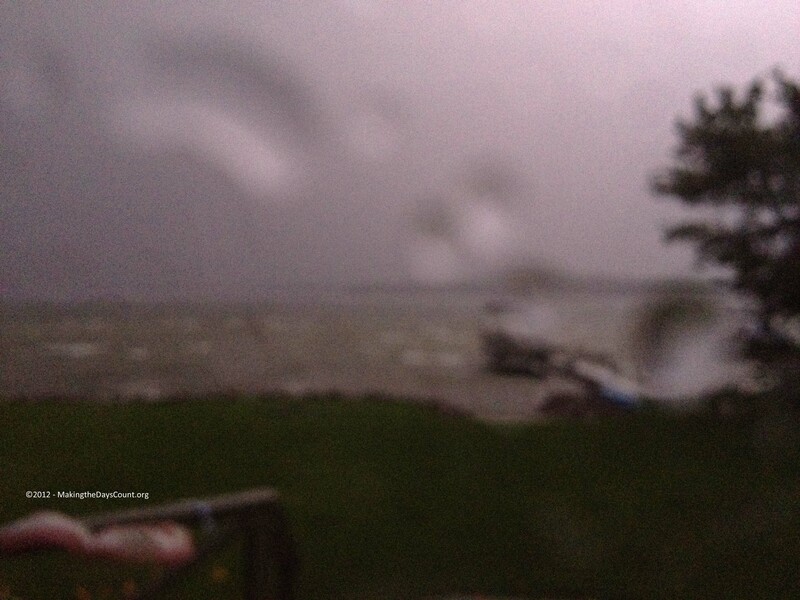 The storm was fun to watch with the lightning flashes and strikes across the lake. It was great to be able to see the entire sky and the open horizon. We all stayed up until the storm wound down and then we all went to sleep. The power came back on a little after three and it seems we left every possible light switch on and Ivy decided it was time to switch into guard dog mode and began loudly barking and running around the cottage, waking B and I up. I let her outside where she paced and sniffed around the yard barking in the direction of the woods before coming back inside. With all of the lights out and Ivy satisfied, we climbed back into bed and she went back to sleep, satisfied the cottage was safe. When I woke up, the lake was clear and it was a beautiful Tuesday and I took my time getting started – coffee, Ivy out, and writing. I checked the rain gauge – 2 ¼ inches – WOW – and I saw that several counties around us had power outages, too. That was a yesterday morning and somehow getting the post up and visible did not happen. It’s Wednesday and I have a date to go fishing with O – Queen of the Bluegill. She has been asking to go fishing and I have been putting it off on the unreliable boat. But, I think it is fixed and there is only one way to find out! W has selected the Ghosts of War book and is planning to start today. I am still working on Fallen Angels and there is still weeding and gardening to do. However, those will have to wait until after fishing! Today is gonna be a great day, I know it. So I had better jump up, jump in, and seize the day – today is gonna be a great day. Making the Days Count, one day at a time, especially when they are numbered! Have you ever watched a lightning storm? What do you remember? Loved Life as We Knew it (and the sequels)! The lake sounds like a ton of fun–enjoy the rest of the summer! I read The Dead and The Gone a couple of years ago and have life as We Knew It and the third book sitting on my night stand. Life and other books have taken a higher number! The lake is awesome, even with weeds. Thanks for dropping by!